Bubble wrap ocean paintings with Swimmy by Leo Lionni. Wire fish mobiles with Alexander Calder. breaking news: takoma park little loft opens! Last Sunday (May 17th) marked the opening of our new Little Loft location in Takoma Park. We'd like to thank the over 125 visitors who came by to show their support and tour the space. Our mission at Little Loft is to provide an inspiring place where parents and caregivers can share in the creative process with the children in their lives. Over the years, we've added camps, workshops and classes so that young artists can explore their artistic curiosity in more depth. We're excited to share this space with new families and hope to see some of our Capitol Hill families too! The largest light filled space is reserved for art parties, camps and invitations to create. The toddler room is tailored for ages 1.5-3. 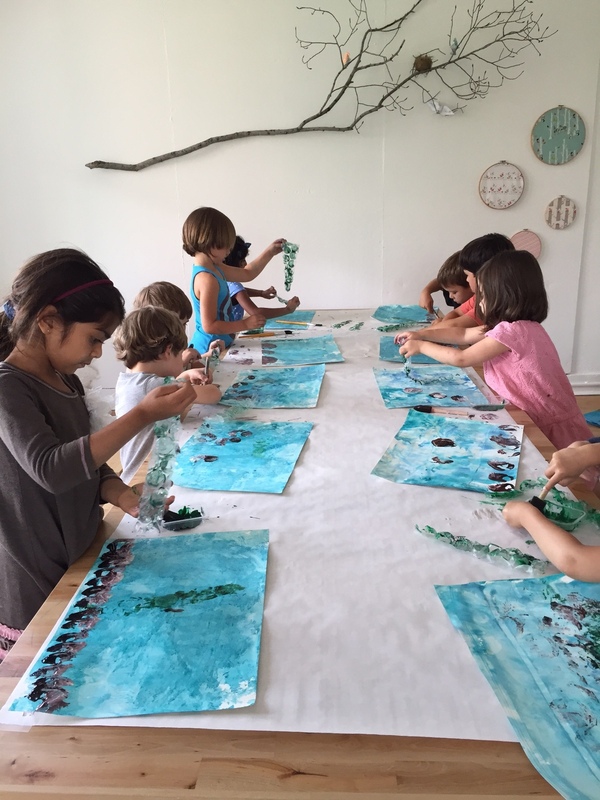 We'll offer themed classes and currently offer drop-in art/play times. Designed for tactile exploration (sand, play dough, water) and age appropriate art projects. Older kids happen to love it too! Our toddler room motto: come in for the art and stay for the moon sand! What studio would be complete without an art supply collection? We feature one in our Capitol Hill location. One of our beloved students named it "The Wall of Awesome" so we had to create one here too. This room and the supply wall will be used for classes in the fall.